If you are looking for a job in blockchain or exploring the possibilities of reskilling and a career change where you can work towards becoming a developer of decentralized apps, today’s episode should inspire you to make somehting happen. The B9lab mission is to educate as many people as possible who are interested in being a blockchain developer. As the leading provider of blockchain education, B9lab is at the cutting edge of all new protocols and advancements in the blockchain space. Their team is comprised of leading engineers, developers and entrepreneurs who share a passion for disruptive technology. Hundreds of major corporations around the world have counted on B9lab for their blockchain training services — including Accenture, Bank of America, Nissan and Fidelity Investments. Their Blockstars Programme trains the very finest new talent in the blockchain space, helping both rising stars and established companies find the best fit possible. I wanted to find out more about their Ethereum Blockstars Programme and their goal of finding and training hundreds of developers, and making them job-ready. With the rising demand for blockchain talent, the need for quality education is ever-present. 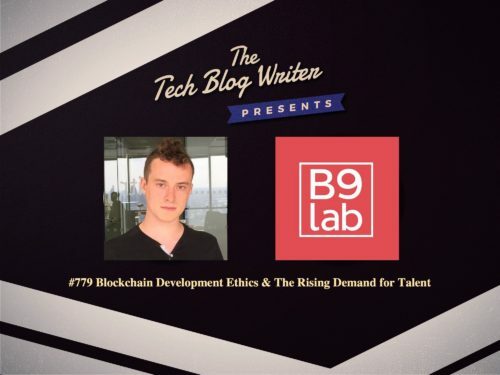 Co-founder and Community Manager of B9lab, Elias Haase joins me on my daily tech podcast to discuss the role of ethics in blockchain development, as well as how the community is keeping up with the demand for more and more jobs in this space. With a background in Artificial Intelligence, neural networks, and evolutionary computing, Elias has more than 10 years of experience building and running digital products. A developer by training, Elias previously worked in alternative finance and fintech, building platforms for crowdfunding startups including crowd-investment, crowd-equity, and crowd-lending.